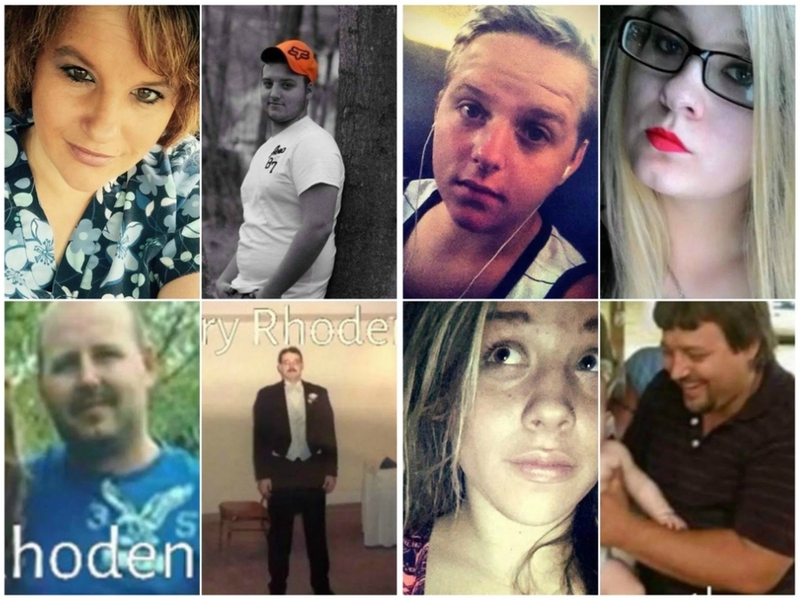 LONDON, Ohio -- More than two dozen investigators are focused on solving the slayings of eight relatives who were found shot in southern Ohio two months ago, officials overseeing the top-priority investigation said Tuesday. In terms of the manpower and resources devoted to the case, it's shaping up to be the biggest in the history of the Ohio Bureau of Criminal Investigation, Attorney General Mike DeWine told The Associated Press. "We're here for the duration, whatever that is," DeWine said. Authorities have reviewed about 700 tips and 100 pieces of evidence and relocated the four mobile homes where the bodies were found to preserve the crime scenes, but they refuse to reveal how much closer they might be to identifying any suspects or a motive, saying they don't want to jeopardize the chance to catch and convict whoever's responsible. Seven adults and a 16-year-old boy from the Rhoden family were found dead April 22 at four properties near Piketon. A newborn, another baby and young child weren't harmed. A coroner determined all but one of the victims had been shot repeatedly, and some had bruising. "You can't be in those scenes or meet with the family members and not be impacted," bureau Superintendent Tom Stickrath said Tuesday in a joint interview with DeWine and Pike County Sheriff Charles Reader at the bureau offices in London. Reader said he has spent nearly $150,000 on the case so far, including staff overtime and expenses for moving the four mobile homes to a secure site to help preserve them. But, he added: "We can't put a price on eight bodies." DeWine said it's difficult to explain the massive amount of information investigators are sorting through as they try to unspool how the victims lived for clues to why they died. Investigators say they have stayed in touch as needed with surviving family members, who haven't responded to messages seeking comment through the county's victim advocate. Authorities said marijuana growing operations were found at three of the crime scenes. That's not uncommon in the area, but it fueled rumors that the slayings are drug-related — one of numerous theories that have circulated. "Right now, it really does feel like they don't have a handle on who might've done that, but that may not be true," said Michael Benza, who teaches criminal law and procedure at Case Western Reserve University. "Part of that is just what you do in the investigation. If you're not ready to go make an arrest, you don't want everybody to know you're getting close, because then they're going to run." Investigators are maneuvering along a fine line, working to get answers for a concerned community while racing an invisible clock and knowing that as time passes, fewer clues will turn up and the likelihood of the case going cold increases, Benza said. Still, it's uncommon for a mass killing to go unsolved, whether it involves a family or unrelated victims. Having multiple crime scenes complicates the investigation because there's more space to search and more evidence to process, but it could benefit law enforcement because there are more places where useful clues might be found, Benza said. In and around Piketon, people seem to feel safe — "almost normal" now, longtime Pike County Commissioner Harry Rider said. But he said many remain more alert about their surroundings, watching who's around or checking more carefully when someone pulls into the driveway, just in case.